Home > Ask Our Experts > What Can we do About our Neighbour's Noisy Dogs? Q.Since our neighbours moved in around 9 months ago we have had constant issues with their dogs continuely barking day and night. They live in a small two bedroom house with a tiny garden and the dogs are labradors. Their barks are really deep and loud and can be heard easily in our house. Whenever they go out the dogs bark non-top for hours, keeping our one-year-old awake. When they go into the garden it is horrible and they go mad if they hear us at all. What can we do? 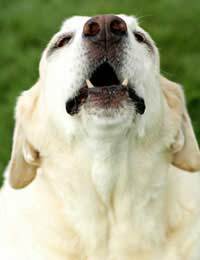 Persistent dog barking is not acceptable by law but before you take any formal action, it might be worth visiting your neighbours first and explain the situation to them as they may not be aware that there is a problem. It can be a nightmare to live next door to a dog that is Barking Persistently, but the good news is that there is usually a reason for this behaviour. If both of your neighbours are out at work all day, the dogs are likely to be barking because they feel lonely and/or bored. There could be other explanations, too. For example, they could be neglected and have medical problems, or they might simply be defending their territory. Alternatively, the owners may simply not know how to train them or they haven’t even bothered to try. Whatever the reasons, it’s not acceptable so if the barking continues after you’ve spoken to your neighbours, then you should contact your local authority’s dog warden service. Once you’ve explained the situation, you’ll usually be given a record sheet to complete in which you’ll be asked to rate the level of noise, the exact time(s) it occurs most often, for how long it persists and how it affects you and your family. If the dog warden then decides to investigate, they may want to come and install sound monitoring equipment in your home. If that happens, and the results indicate that the law is being broken, then the dog warden is likely to pay a visit to your neighbours. Initially, this may be done with a view to informing them that there is a problem and also to check on the welfare of the dogs in question. Issues such as the suitability of the property to keep two Labradors may also be discussed and, at this stage, they may offer training advice to the owners. However, if the noise persists after the owners have been given a deadline by which to resolve the problem, then the local authority can issue an Abatement Notice. Then, if the barking does not stop, the owner could very well be taken to court. However, there is also the chance that your local authority might deem the barking not to be a statutory Noise Nuisance. In that event, they should be able to provide you with an information pack should you decide that you want to take the case to the Magistrate’s Court yourself. My neighbours leave their dog in their garage whilst they are out at work.The garage door is left open and it has access to the back garden. It barks and whines all day long whilst my neighbours are at work - is there anything I can do about this? These dogs only live like a couple gardens down from me,but l think all my neighbours can hear in the night is either howling or barking.l am going to report them but I'm just 12 why would they listen to me? Plus l always have to go to high school so l most definitely arrive tired out.I have told my parents and l am going to tell them to report??. I live in a semi detached house and my neighbour runs a dog care business from there home. Although she is good with the dogs they are always barking and I think for the amount of dogs she has her garden isn't big enough. I am unable to approach these neighbours as they are unreasonable with any requests suggested. It is noisy constantly.How can I report them without them knowing its me?I'm sure all the other neighbours around the house and at the bottom of the garden feel the same but wont do anything to upset them as they have lived on the estate a very long time.Dog are dropped off early in a morning and picked up during the day and early evening,I know she has a licence but surely there must be something in place on a environment issue. I was also wondering how big your garden area should be to look after 8/9 dogs? You will have to ask your local council licensing department about the conditions for the dog care business licence. You could make this a general request rather than anything specific. If you want to complain about the dogs barking, you will have to provide your name or the council (environmental health for this one) will not take action. The council will not necessarily pass on the details of who has made the complaint to the neighbour. hi i have 3 small dogs(jack russells and a larger mixed breed dog.my neighbour is constantley trying to get at us about our dogs barking in our house and back garden.My wife is at home all day with the dogs and the minute they start to bark in the garden she brings the dogs in.My neighbour is harrassing us via the council and she also has been minding a friends dog which she deliberatley lets out when she sees my dogs in the garden to get a reaction so she can record the dogs as evidence for the council. we are constantley keeping are dogs from not barking too much but nothing is good enough for her.The dogs occasionally bark at night when my son comes in from work but this is for no more than 30 seconds and they stop the minute they know its him.we are in despair as this woman will stop at nothing and is making us both depressed as we know we are trying everthing to minimise any nuisance noise. Hi, My neighbour has 3 Chihuahuas and one mixed breed dog. They all bark from morning till night. Whenever she goes out at night, the mixed breed will bark until she gets home which is sometimes 1am. But however bad this is, it's not as bad as me not being able to be outside in my own garden as they bark at us. I have a 9 year old son and 2 dogs myself. My dogs are never allowed run of the garden even in the summer as her dogs will attack the fence and my dogs will retaliate.My dogs are otherwise really well behaved so this is very unusual for them to do. My dogs get told off and brought inside straightaway, my neighbour leaves her dogs to bark. I asked her once why she doesn't do anything about the barking as it's not nice for the neighbours. Her reply was she didn't care what the neighbours thought and the barking didn't bother her. She locks her dogs outside from morning til night all weekend which means I let mine out to do their business and they come straight back inside. My son and I can't play outside as any noise we make sets off my neighbours dogs and they go mad and attack the fence again and they don't stop until we go back into the house. I hate it. I feel trapped in my own home. My dogs are trapped inside in gorgeous weather whilst hers are having fun barking and running around outside. She won't do anything to help. All I get is abuse. Any advice would be appreciated. Hello,I am stuck in a predicament. Our council has allowed a neighbour to start a dog boarding and walking business from their home. This home is in a very tight, close proximity council estate,our gardens are all backed on to each other like a giant circle. All be it, they have a big enough garden as do most of us. But, we are constantly being disturbed most days if not every day some weeks. It can be as early as 6/7am the noise starts, then it goes on and on.. Intermittently through out the day.I have spoken to the neighbours in question and they basically told me it wasn't their dogs and when it is they quieten them straight away.. It is their dogs, I know this as my garden is attached to theirs. I have spoken to the council, I said, did they not think the other neighbours deserved a choice on this business happening, apparently, not. We don't have a choice. This has been running for months now.. Possibly a year. Any help or advice would be appreciated. Thanks. I have one dog,who gets let out in the garden at 06:15 in the morning to relieve herself,then comes back in,very rarely does she bark unless she deserves a cat ( surprise),and if she does I am there to get her back in and quieten down quickly, however if she does my neighbour" retaliates " by playing very loud music,waking up my children in the process!! I appreciatedogs barking in the early morning can be a nuisance but his behaviour is nothing but childish,. Note : no-one around my area can stand the man either, because of his attitude and bully type behaviour. 2nd note,no one else has said, complained or even mentioned when my dog barks. The neighbours across the road have three husky’s that howl for a good hour or two every morning. I know howling is part of their behaviours but it wakes everybody up at 7/8 in the morning and goes on until 9/10 ish. It’s pretty debilitating for morale. Is there anything I can do, any action I can take? They live in a tiny garden too, so I wonder if they are in distress. I love dogs to pieces but this is really taking me to the end of my tether. Thank you. Hi, I've recently lost my farm due to development and I ran a horse/dog rescue. Ive moved in a council house and have one dog inside n one dog outside, he lives outside a kennel that's like a play house very big, and ive used all excess carpets to cover inside n floor, as well as a old fluffy rug and three loose soft throws he also has a warm n waterproof coat on. Hes walked every night to run off excess energy and has warm gravy on his biscuits and porridge on a morning. Hes always lived out since I rescued him in 2009 as he frets, looses weight and is unhappy indoors hes a mastiff x. Now ive received a complaint that he is abandoned outside 24/7 and is howling and disturbing residents. Now he doesn't howl ever ive got social anxiety and rarely leave my house so hes not left long periods, ive a partner n two kids there's always someone at home yes he barks when someone on a night is heard from flats behind garden,when next door who own there house let there four farm dogs out(who dnt get walked and howl constantly when left alone) when cats run into garden but I go out and say shush n he does. But abandoned he isn't I go above n beyond to make sure hes ok n warm and these allegations after losing everything and spending years caring for rescue animals has made me so angry. What happened to knocking on peoples doors and sorting any problems out ? I'm now scared to what happens now? Why is my dog getting blamed for howling n next doors who sound like a kennels arnt. If I bring him In it will make him poorly is that not cruel. Long winded but thought I'd put how I feel on receiving end of complaints. If the local authority investigates, tell them that you think it's a neighbour's dog that is howling and explain what you've said in your post about your dog. I’ve got 3 dogs one stays only half the week as he is my partners dog, my new puppy I have tought very quickly to be quiet as my neighber complains of any noise after 9pm, but when my 3rd dog comes he’s an attention seeker so he’ll bark to get your attention the solution is to ignore the barking but I can’t because of the neighbor, he never barks continuously we don’t allow it but he will bark once or twice throughout the night untill he settles, I try my very best not to wake my neighbor, but I don’t understand what they expect me to do, it’s causing my partner to have to go home, the dog that barks is a puppy himself he’s not a year old yet, my neighbor has a dog and we never hear a bark or a sound, I really am not just letting my dogs bark the puppies are in the bedroom with us so we can address it quickly, I can only do so much with the dog as he is only here half the week, when he barks we tend to quickly ask for a sit or down or take him out to excersise him I’m giving into the dog to stop my neighbor complaining but that is only going to make it worse??? Have you spoken to the neighbour about this? As dog owners themselves they might understand the problems you're having and that they will only last for a short while until the dog has got used the routine. Hi, I've recently lost my farm due to development and I ran a horse/dog rescue. Ive moved in a council house and have one dog inside n one dog outside, he lives outside a kennel that's like a play house very big, and ive used all excess carpets to cover inside n floor, as well as a old fluffy rug and three loose softthrows he also has a warm n waterproof coat on. Hes walked every night to run off excess energy and has warm gravy on his biscuits and porridge on a morning. Hes always lived out since i rescued him in 2009 as he frets, looses weight and is unhappy indoors hes a mastiff x. Now ive received a complaint that he is abandoned outside 24/7 and is howling and disturbing residents. Now he doesn't howl ever ive got social anxiety and rarely leave my house so hes not left long periods, ive a partner n two kids there's always someone at home yes he barks when someone on a night is heard from flats behind garden,when next door who own there house let there four farm dogs out(who dnt get walked and howl constantly when left alone) when cats run into garden but I go out and say shush n he does. But abandoned he isn't I go above n beyond to make sure hes ok n warm and these allegations after losing everything and spending years caring for rescue animals has made me so angry. What happened to knocking on peoples doors and sorting any problems out ? I'm now scared to what happens now? Why is my dog getting blamed for howling n next doors who sound like a kennels arnt. If I bring him In it will make him poorly is that not cruel. Long winded but thought I'd put how I feel on receiving end of complaints. My neighbours own their house and we rent it, their 3 dogs bark endlessly and we don't know what to do as we could be kicked out easily where as it's harder for them will us renting the house affect this? My neighbour has 3 small but quite biggish dogs. He rarely takes them out and he works like 10 hours a day. These dogs are so loud they make your eardrums burst! When me and my family first moved in the council told us that we aren’t allowed to have pets or they would get taken of us, that’s including my neighbour. And we’ve lived here for about 3/4 years and he still has them. The dogs barking makes me physically want to cry!! Your council's housing officer should take action here if there is a no pets rule. Write a formal letter to the housing office first of all. If this does not resolve the situation, report the barking to environmental health as a noise/nuisance complaint. Your local councillor might be able to support you if you're not satisfied. If you are concerned about the welfare of the dog, contact the RSPCA or your local dog warden. My neighbours bought a small terrier-a 'yap dog'. Their kids work it up but they failed to train it so that whenever I go out to the garage, the car, the bin or dare to walk in my garden the darned critter just yaps continuously. I pass so many dogs and I have had 3 generations of dogs and they don't yap! I guess they are so used to it they do not realise but they must be as stupid as the dog (or vice versa) because I have not spoken to them for over a year and walk away whenever the wretched animal yaps at me. I just swear at it in Polish to feel I have achieved something! I bought a barkbuster but it is too stupid to take any notice. I think I will write a curse on a piece of lead, fold it over and chuck it in the river like the Romans did. I can go in my garden at night or I could wear industrial ear defenders...They are nice neighbours and nice kids. I just cannot understand that they haven't become embarassed by the obvious loss of familiarity on my part. They must be dense and the mutt obviously has no brain. I have a neighbour who has 4 small dogs who bark throughout the day and also at night, the owners know they are doing it and sometimes stand out in the garden with them still barking and don't try to stop them! In the summer we cannot open our windows at night as they sometimes set off at 2am and later! It's whenever they put them in the garden, they bark at anything and everything! What can we do? New neighbours moved in two and half years ago, used to be neighbours of a relative and whole family were notoriously noisy! Three kids, then two dogs, one of which we nicknamed 'the 6:30 alarm: because when he got up for work and let it out it started barking and that goes on all day until the evening when they take it in. been very patient and given them plenty of time to train it and sat times many in our garden during the summer listening to it for HOURS on end (strangely the other one never barks) thinking that eventually it would settle down. While the kids are running around playing with the dogs it isn't a problem, as parents of three (now grown up) we now youngsters can be noisy, the problem is when the dog(s) are left in the yard and one of them just barks non stop, and they do nothing about it! Another neighbour said it was driving him and his wife mad, and one neighbour sold up and moved saying the dog was part of the reason they were going! So I've finally bit the bullet and complained to him after it was left barking until beyond 10pm on two occasions. His reply? It's acceptable until 11pm, I've only had cause to complain twice in two years and other people on the street have dogs that bark! No matter how I tried to reason with him he wasn't interested, "no one else was complaining" (plenty want to but would rather leave it to others), "other peoples dogs bark" (I did point out apart from his there wasn't a sound) and it's not acceptable , even during the day to which he replied " you do what you need to do but the dogs are staying". I didn't want to be the grumpy bloke who complained but last night it got the better of me! And today? Not heard a sound all day, and I do mean not one bark, but I'm not expecting it to last. When it starts again (which I think it will in a few days) I'm lost as to what to do next. Don't really want to go down the road of formal complaints to the Council unless I can get a few of the other neighbours onside. Thoughts anyone?